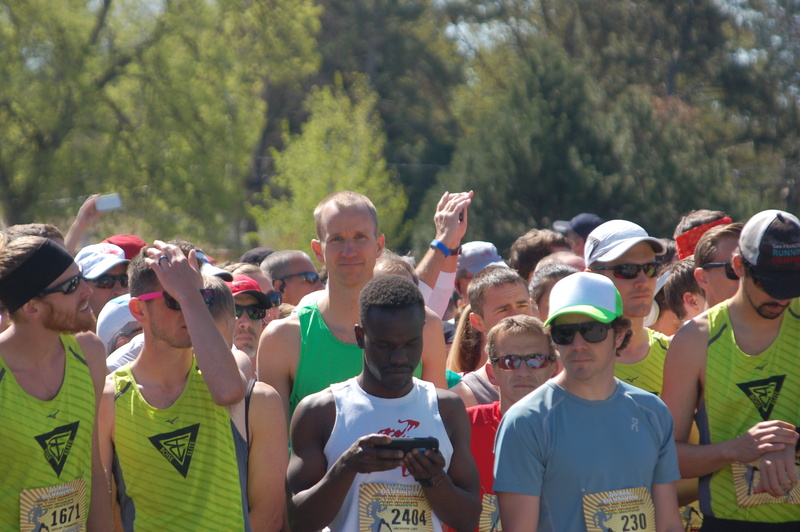 The Race to Robie Creek is to Boise what the Boston Marathon is to Boston. It’s big (by Boise standards), it’s fun, it’s competitive, and it seems that most of the town knows it’s going on. 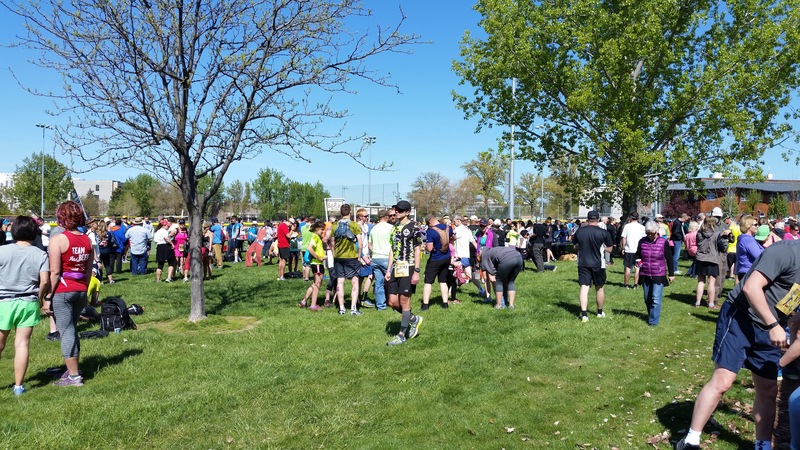 This year’s Race to Robie Creek brought out some fast runners and, as usual, the weather cooperated nicely on race day. I approached my 7th consecutive Race to Robie Creek with a goal I set several months ago, and I was able to meet my goal almost exactly. In fact, I beat it by 7 seconds! Sign ups for the Race to Robie Creek take place on Presidents’ Day at noon. To make sure you get a spot, you need to be at your computer, refreshing your browser when the clock strikes 12:00. Cyndi (my wife), Jerry (my father-in-law), Kara (my sister-in-law), and I were all able to secure spots this year. 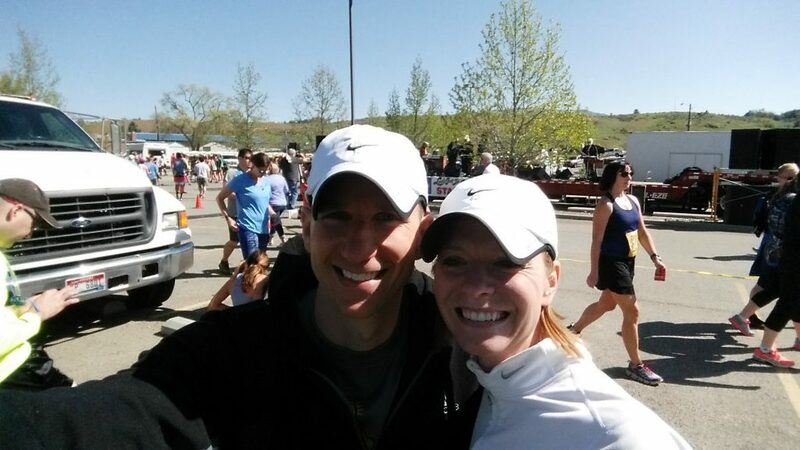 Last year I ran with Jerry and Kara while Cyndi was about 8 months pregnant with our baby. We were all excited to race together this year, but unfortunately both Jerry and Kara had to pull out due to knee issues. That was disappointing to us all and we hope we can all do it again in the future. 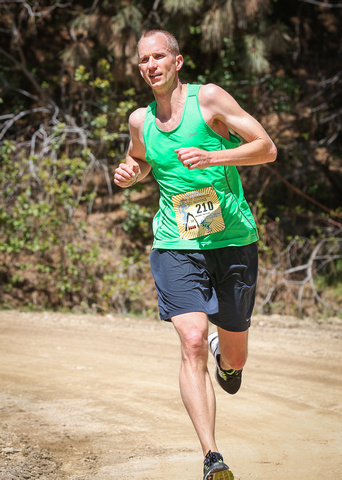 Last year I ran the Race to Robie Creek in 1:31:10, or an average of 6:58/mile. That was good enough for 18th place, which I was very happy with. At that time I hoped to run Boston in 2016, so I wasn’t planning on running Robie this year (Boston and Robie take place two days apart this year). Well, after missing the reduced Boston qualifying time, I reset my sights on Robie and quickly came up with a goal. My goal was 1:24:59. I felt that I could improve by about 6 minutes, and sub-1:25 seemed like a good target to shoot for. I also wanted to break into the Top 10 and figured this would get me there. This would be ~6:28/mile average. ~6:15/mile on the pavement (the first 3.4 miles). This would put me at ~21:00 when I hit the dirt. This section has a fast and flat first mile, then a 1 mile uphill, then a little downhill followed by some rolling uphills. ~7:45/mile on the dirt. This is the 5 mile climb from where the pavement ends to where the hill peaks. I need to hit the top at ~59:45. It has some grueling sections, particularly the last 0.8 mile that is very steep (many people walk this section — I used to). To hit the pace I’d need to go faster than 7:45/mile during the first 4 miles of this section since the 5th mile would be slow. ~5:30/mile on the downhill to the finish. The first mile is extremely steep and I expected to do it faster. The last couple miles are always a challenge for me to keep my feet moving. I felt pretty good about hitting the first section. I was unsure of being able to climb the hill that fast or run down the hill the fast. What gave me confidence was that I had a fantastic winter training season. From January through March I did more miles than I’d ever done in 3 months and my average pace was looking about 30s/mile faster than the year before. I didn’t get sick or injured and did a long run basically every week and mixed in some hills for some of the long runs. I also felt that in 2015’s race I didn’t push the hill quite as fast as I should have. The only run that caused me to doubt was a 20 miler I did 2 weeks before the Race to Robie Creek. It was only about 15s/mile faster than I did the year before on a very similar run. I ran a hill and my legs just weren’t there. I think it was due to a bit of over-exertion on a cross training ride the day before and my run the day before that. Otherwise, 30s/mile faster was looking just about right. Cyndi and I took the kids to packet pick up on the Wednesday before the race. 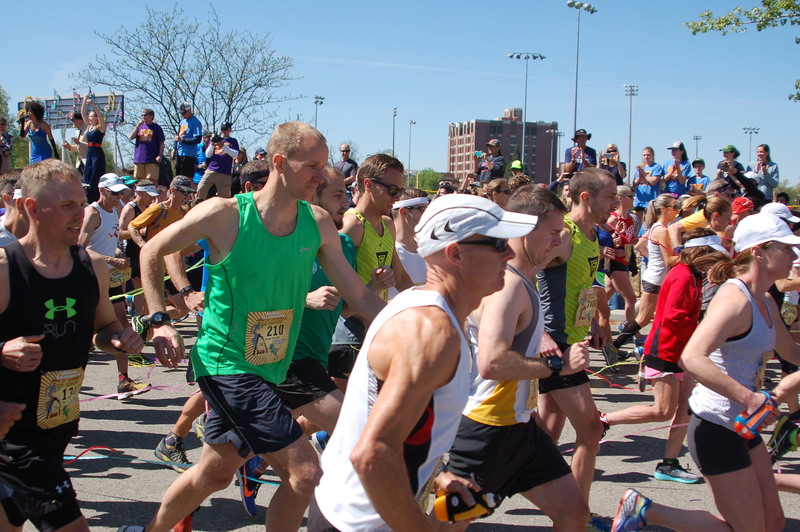 You can pick up your packet on race day, but it’s a fun atmosphere and going early means one less thing to worry about on race day. 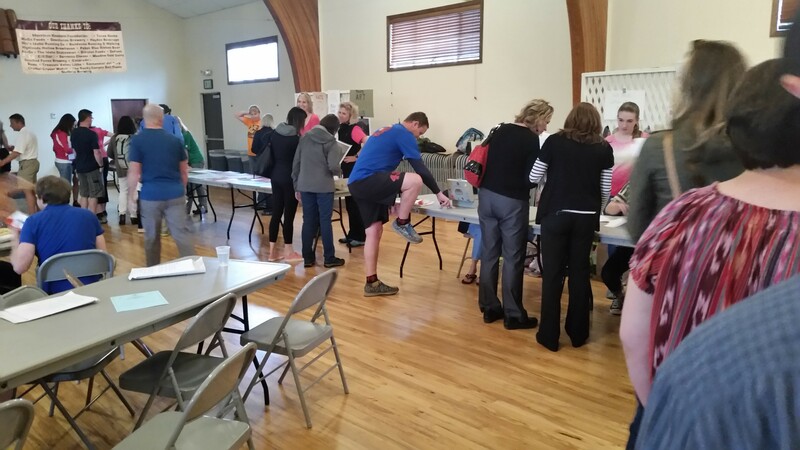 We were able to sell Jerry’s and Kara’s bibs a couple weeks before the race. I did a couple afternoon workouts the week leading up to the race to acclimatize to the warmer weather and to work on eating right. On Friday I didn’t exercise at all and ate the same way I had the day before the 2015 race, as it had worked out pretty well. The noon start time always throws me off a bit. Unfortunately I had a cold coming on all week. I thought it was allergies on Monday and Tuesday, but on Thursday night and Friday I knew I had a cold. I was just hoping it would stay out of my throat so I could breathe ok. I’ve ran with colds before and they generally don’t affect me too much as long as I’m not running on the peak day or two of the cold. Friday night I slept well until about 4am. Then I was pretty miserable with the cold and preoccupied with the upcoming race. However, when I finally rolled out of bed on Saturday I was pretty congested, but my energy felt great. I ate breakfast, snacked, went to my son’s first soccer game, at my last pre-race snack, dropped the kids off at grandma’s, then we headed to Ft. Boise to start the race. We got there with about 50 minutes to spare. We had met up with my friend Adam Young, who was in town from Provo to run. After using the restroom a couple times, Adam and I went for a little warm-up jog around the softball fields. Usually I don’t do this for a half marathon, but I was hoping for a fast start and knew that I had sufficient endurance built up that it wouldn’t affect me too much. 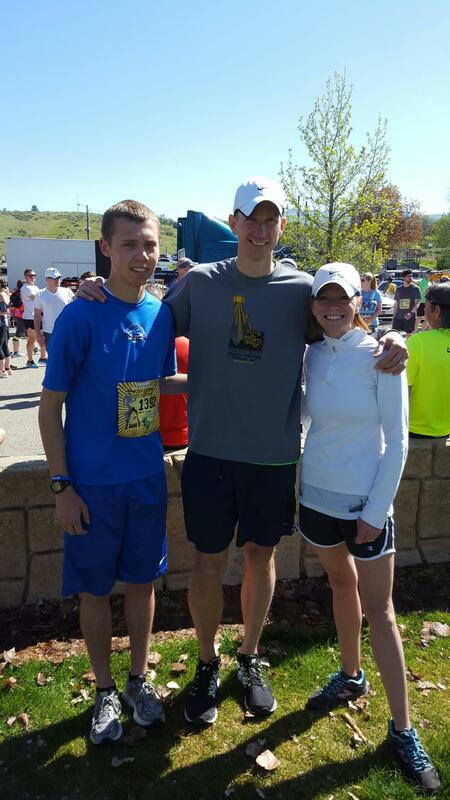 Adam, Cyndi, and I before beginning the Race to Robie Creek. I lined up with about 10-15 minutes to go after telling Cyndi good luck, then I danced around to keep warm while I waited for the gun. A team of fast-looking 20-somethings in matching jerseys with “Boise Elite” printed on them lined up near me and my hopes for a Top 10 finish immediately subsided. Oh well! At least I still had my goal time to aim for. That was my target and whatever that placed me would have to do. Waiting for the Race to Robie Creek to start. Note the running team lined up around me. The weather was sunny but not too hot and with a light breeze. I debated wearing my favorite hat but ultimately left it behind. After a lengthy performance by some Mo Town singers and dancers, we started running. 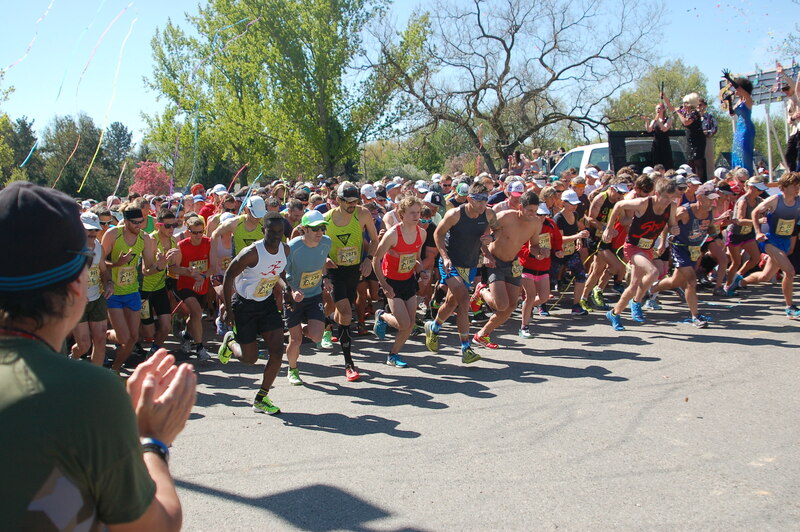 Start of the 39th Annual Race to Robie Creek. Navigating the crowded field for the first few yards. The first mile went well. After clearing the first corner and getting a little more room, I forced myself to take it easy and I backed off my initial pace to get closer to where I needed to be. About a half mile in a friend from work cheered me on from the sidelines which was nice. I saw another coworker, Tom Liby, just ahead of me. I figured there were about 25 people ahead of me at about 0.75 miles, but right when we hit the bottom of the first hill I passed several of them and found my groove. I wasn’t sure exactly where I was place-wise, but I could see a lead pack separating ahead. There were a bunch of the “Boise Elite” jerseys up there. I pushed up the hill and based on my splits at Mile 1, the start of the hill, and Mile 2, the top of the hill, my pace was just right. Due to my cold, I was hacking and wheezing quite a bit. This was especially a problem when I was trying to drink at the aid stations. I hacked quite a bit all through the first 3 miles. I was slightly worried that it may cramp up my abs, so I tried to relax. Eventually I started to breathe easier and it became less of a problem. I ate a Gu block before the Mile 3 aid station and noticed my mouth was really dry. This became a problem with my next block later on. I ended up consuming only one 90 calorie package (including what I ate right before the gun), and I decided not to attempt the other package I had in my pocket as they were too hard to choke down. I hit the dirt right around 21 minutes — which was just right. There were a couple other guys near me and we would keep each other company for the next 4 miles. I worked the hill as hard as I felt I could. Some of my half-mile splits were around a 7:15/mi pace which is what I needed to reserve some time for the last steep section. I worked continued working on the few flattish spots and was able to make up some time for the steeper spots. I was about 100-200 yards behind Tom Liby when we hit the dirt, but I never saw him after that. The two other guys nearby and I pushed each other. It was good to have them near me, but I was really focused on my Garmin and just pushing the best I could, without worrying too much about the other runners. Climbing the hill at the Race to Robie Creek. The aid stations went well. I swallowed as much water as I could handle and tried to keep well-hydrated. I knew from experience that I always became thirsty on the back side. I worked the steepest section of the hill on the Race to Robie Creek as hard as I could. To make my time I needed to hit the top at under an hour. I was feeling really good overall and was excited when I came over the mat on top at 59:33. The Race to Robie Creek is known for its uphill, but the downhill has its own challenges. Once I peaked, I immediately accelerated to a barely-controlled pace. I had to fight the urge to lean back and brake too hard. I wanted to go fast and that meant moving my feet as quickly as possible. I knew there was another runner somewhat near me. I assumed there was another right behind him. I raced as fast as I could down the initial 2 miles. My pace was on target. I was faster than the 5:30 target, but I knew that was necessary as the hill would flatten a little after Mile 11. I started feeling my legs quite a bit around Mile 10, but I fought the urge to slow down as much as I could. I wondered if I might reel in a runner ahead of me, but I couldn’t see anyone. It was pretty lonely. The curves make it difficult to see very far ahead. It was nice not to be passed by dozens of people like what has happened to me in previous years. Finally around Mile 11, the runner behind me came charging ahead at a pace I had no prayer of keeping with. I don’t know how he did it. He blew by me and kept going until he was out of sight. Mile 11 was a little weak for me, but I felt like I picked it back up at Mile 12. I knew I was close and I charged ahead. 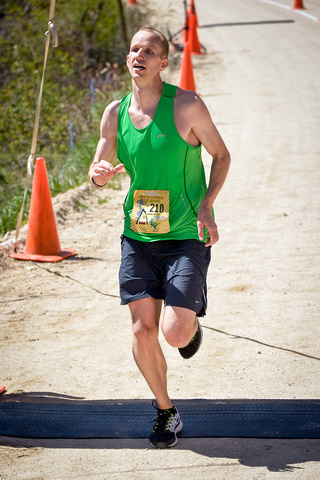 I finally saw another runner ahead of me at about Mile 12.75, but it was too late to catch him. He was one of the “Boise Elite” runners. I was gaining on him, but he had too much of a lead for me to make up the difference. Perhaps if we had another 0.5-1 mile I could have caught him. I knew I was cutting it close to hitting my time, but when I saw the finish I was able to pull in just under 1:25:00. My official time ended up being 1:24:52. I was very happy with it and pleased to be done at last! 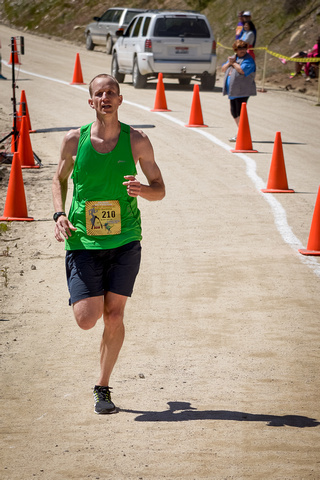 Ugly finish line photo at the Race to Robie Creek. I could have sworn I was trying to look good for the photo! I was thrilled to have hit my goal. In further reflection, I’ve realized that had I run 8 seconds slower, I would have been slightly disappointed. Funny how that works. I congratulated the guy that passed me for his strong finish. He told me that he was pretty concerned when I was hacking during the first few miles but he was glad when it mostly stopped. I apologized but told him I had a cold and there wasn’t much I could do about it! I grabbed my bag and a plate of food. I skipped the baked potato this year since I always take more than I can handle. Then I headed a couple hundred yards up the course to cheer on other runners and await Adam and Cyndi. Adam had a good race. He came in at 1:39:17, which was great for his first showing at Robie Creek. He got 5th in his age group. I saw a few coworkers come in – Rusty got a PR, Matt did well, and Tahnee had a good run. She missed her goal by a few minutes, but she had run another half marathon a couple weeks before. Cyndi came in at 2:07 and I was excited to see her. She did well and had a fun race. I reminded her that I got 2:07 just a few years ago, in 2012. We ran into a couple other friends in the crowd below, but after getting some food and chatting we headed home. My in-laws were in town and we had a nice, barbecued steak dinner and homemade ice cream with them, my parents, and Adam and his dad. It was a great finish to a great day. I’ve determined that the Race to Robie Creek is my favorite race. It’s in my home town. It’s fun. It’s competitive. It’s quirky and unique (noon start time, limited entry, silly themes, etc.). It’s also a race I can do (almost) every year and measure my progress. I’ve been blessed to have been able to train mostly injury-free for a few years now. I’ve found that consistency in training and remaining injury free has been the key to improvement. I used to take long breaks from running, but I’ve been consistent in the past few years and it has yielded nice dividends for me. My point is that consistency and hard work can work well for anyone at least to some degree. Of course, injuries can destroy everything. I know that eventually I will either peak or become injured, but until then I hope to carry on. I also know that not everyone cares about improving their time at a silly race. However, I think that the same principle can be applied across other areas of life — parenting, relationships, education, work, gardening, weight loss, etc. Basically, with the right focus and effort we can get better at anything. There may be hiccups and setbacks along the way, but even those can be overcome with time, especially for things that really matter (i.e. not running). 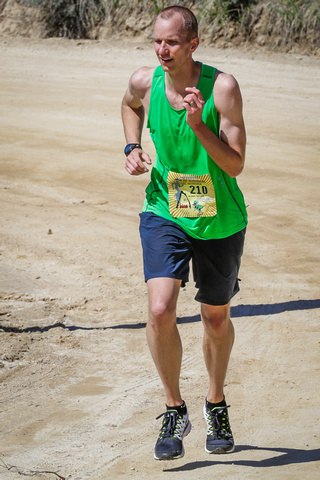 Next Next post: Race Report: Famous Idaho Potato Marathon 2016 – PR and BQ!